We would like to introduce some of our staffs working at various sections. Gion OKUMURA is my first place of employment. What is worth the work? As facing to the guests across the counter table, it is the pleasure to be able to have the conversations, and also can see the reaction about cooking actually. What is your favorite point for the working place? Splendid teamwork! Every one works thinking about each other. What is your dream, objective or ambition? Wish to be a good example of leader who can lead the staffs well. What is your message to the guests? Not only dining, but also you can enjoy selected fine tablewares. We look forward to seeing you. Eight years have passed since I moved in the dining world. It was hard to start again my career in the different type of business, but I am so pleased now with being one of the responsible staffs of OKUMURA. Though there are still so many things I should learn from now on, I head for the improving of myself and the breakthrough of the Takumi OKUMURA. Our guests of 「Takumi OKUMURA」 usually take times in the dining. 「It’s so comfortable here. Hours are slipping away」. When I hear it from the guests, I feel happiness for working in Takumi. Wish to have a farm restaurant. Keep up my spirits to serve good dishes and services, like the guests might forget the time passes by. We look forward to seeing you. The working at the delicatessen of the department store is a fresh experience, so everything is exciting now! The conversations with varid many customers coming everyday. 「Extending 「Gion OKUMURA」 delicatessen stores more and more, making a big leap. What is your message to the customers? Please enjoy the western side dishes different from the dishes being served at the restaurants. Making up the articles of foods by gathering various informations like seasonable ingredients and events, tendency of the daily sales. Can make widely varying menus for more than 30 kinds. Would like to have the inquisitive mind at always and acquire the skill and the knowledge like Naoki Okumura chef. I deliver fresh delicatessen sets every morning! Please add a dish to your dinning table. Not only in the kitchen, but also I am in charge of the sales. Look forward to your visit! The ideal and the imagination take the shape. The creation can comes to the ideal so close. Taking advantage of the present experiences, wish to challenge various things. ORENO PAN prepare a variety of foodstuffs matching to the season. We are sure that you will be able to find something you like. Please come to the store. When I see the smile on the guests leaving the store, I feel happy. Many good customers and many good staffs. Eating delicious foods and having smiles everyday. We will persist enriching the menu and the service in order to let our customers feel happy for coming to the Gion store. I have been brought up by the people and the town of Gion, and have learnt so many things. bad economy or poor financial results. The human resources is the greatest fortune for the business. growing for future. Otherwise it will be difficult to get over tough situations, or you may miss a chance to attack. For that, I think my important role is the improvement of the environment to grow up the staffs. I ask a new staff to start a job by serving the customers at always. No business can stand by ignoring the customer. Some times you deal numbers of the customers at the same time. Talking a guest in front of you and getting a phone ringing for the reservation-it is apt to happen when you have your own store. Don’t stay within your own [role] fixed. Otherwise there is no growth for yourself. At the same, you should not forget the feeling of gratitude for all the staffs working together. Without the cooperation of the whole store team, we cannot make the good services to satisfy the guests. There is a chance equally for everybody. It depends on how you should strive to get it. Naturally you might have a lot of painful things passing through, but no one can gain the success without it. This is my message for people coming relationed to work together. Employment informaton for part-time workers and regular employees. This is Naoki Takashima, and I am in charge of the delicatessen at the Central kitchen now. 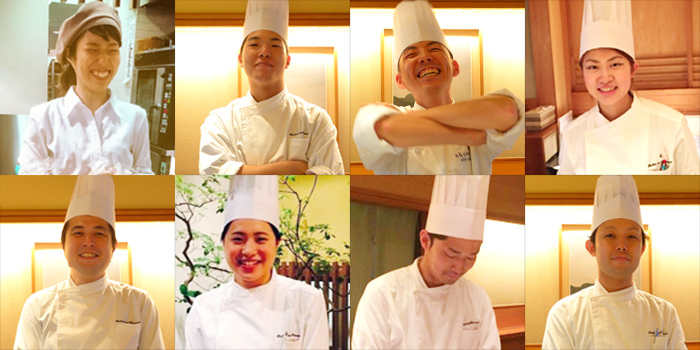 Just until this spring, I was working as one of the cooking staffs at Gion OKUMURA. As the parents were working, I was cooking at home since the junior high school ages. After graduated the college, I became the cram school teacher, but I was not sure if this was the right job for myself. Being in distress for what I really wished to do, I decided to jump into the restaurant business. I have had a very good impression for the Gion OKUMURA when I visited once as a guest. As I had no experience with the restaurant business entirely, the hurdle for the Gion OKUMURA seemed so high for me. Well, I had nothing to loose. I made the application for OKUMURA’s offer of the situation, and to my great pleasures, I was employed!! After one year working at the hall of restaurant, I was able to become one of the cooking staffs to fill in a vacant position arised. Being surrounded with the expert of cooking staffs, I thought I should catch them up as quickly as possible. I bought the books and studied even at the home everyday. Nowadays I am admitted to plan the menu of fish dishes and soups, and sometimes am working with Naoki Okumura chef for the catering. When planning the menu, I specially pay attention for the color usage and the arrangement of dish, so that the guests will enjoy the cuisine by the five senses. It is hard to get Okumura chef’s admission, but it is worth while to do. My dream is to open a creative cuisine restaurant at my home town in future. let him have overall cooking ability. If he looks upon higher point, he may hit the high wall, but I trust he keeps striving. Don’t forget the first resolution. Please contact by phone or mail first, and then send your resume as per stated hereunder.